After 30 years of being a coin collector I've finally managed to accomplish something I've never done before. I finally finished a collection. The way it normally goes is... I buy, then I lose interest, then I sell. Then I buy, and repeat the previous actions. I have not really collected coins for a long while, sold most of the collection off years ago - hence my absence from this website for so long. I have the odd regret about the coins that went. However, there was one set I kept, simply because I think they are beautiful coins and although they were mothballed for years, I added a coin to it every once in a while. Started this set back in 2008 when I was still a semi-regular on this forum, the first two were a 1917-P and a 1929-P. Somehow these two coins managed to evade the big sell off and more than that they even gathered accomplices like a rolling snowball. It was slow and tedious work but last summer I purchased the final missing piece of the jigsaw. 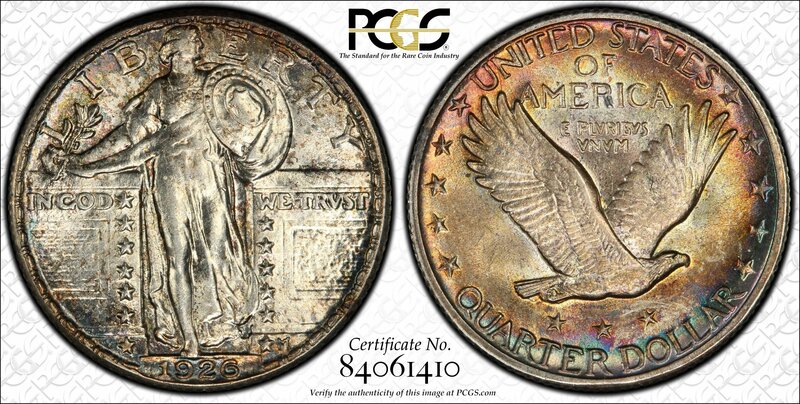 So now I have a complete date run of P mint SLQs from 1917-1930 (I couldn't afford the 1916, so I just ignore that one). All are MS63-64 FH coins except for the 1921 a MS-63 non full head and the 1930 an MS-65 non FH. Here is the last one, 1926-P. Guess I'll have to eat my words about hating slabbed coins! Do I dare to contemplate the D or S mint products? I dunno... they are a lot harder to crack. Maybe I'll try for an S mint circulated set or something more affordable. Maybe AUs? Or perhaps I'll just save up for years and see if I can crack the 1916 in VG?